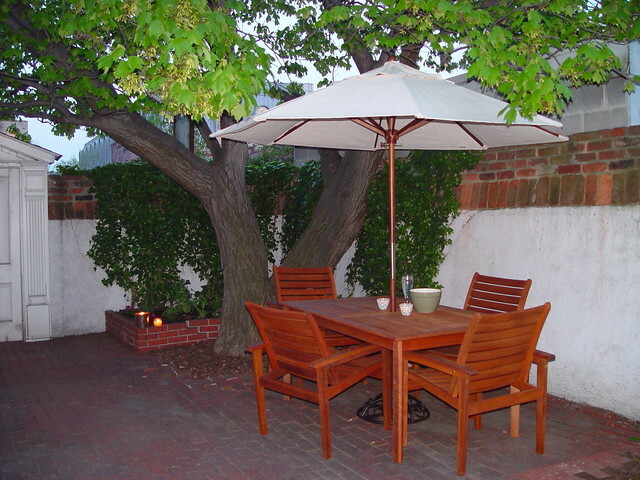 Back in 2003 as first time homeowners, we were excited for spring as it meant we'd be able to use our very own backyard space. After extensive research and flexing our well honed bargain shopping muscles, we found a set of solid teak furniture for a steal at our local Crate & Barrel outlet. After deciding on the new purchase, we stuck the chairs in the small trunk of our Ford Mustang, drove them home, then walked the ten or so blocks back up to get the table. Too large to fit in our car, and without ZipCar or friends that had a truck or SUV, we carried the large and awkward table back to our house (after taking several rest breaks along the way). There's no way we were going to pay for shipping for such a short distance. Wendy excitedly assembled the table in our backyard, carefully making sure to use the right screws and parts. Wow, it's amazing how new everything looks. Ah, memories! We had our yard set up in no time, and we've enjoyed this furniture for more than ten years since that day. Over the years we've applied various oils to the surface, quenching the thirsty wood. At one point we switched over to a teak protector that Smith & Hawken offered. While it seemed to work well at first, I feel like it's slowly stripped some of that great teak character from the wood. Instead it created a bit of a barrier to the wood, which seemed to keep moisture out, but also let the wood slowly dry from within. Though we previously disassembled and stored the furniture each winter, the last two years we've been a bit more lax with the care of our teak furniture and failed to take it inside. This left it open to the elements, weathering and beginning to crack. We felt the table and chairs had a good run, and maybe it was time to retire it? Last weekend, with the looming baby shower, Wendy said, "That table is not acceptable. We've got to do something with it." Presented with the challenge, I decided another coat of the protector we had used in the past was not in order. Instead, I felt we could restore the wood of the tabletop to something a whole lot nicer. Something a whole lot more natural. Something more fitting of the sophisticated event we planned to throw in under 24 hours when I began this undertaking. I ventured into our basement and discovered a bottle of teak cleaner that we purchased from Smith & Hawken as a companion to the protector we'd been using. I also found a partial can of teak oil, which is exactly what we'd ultimately need. 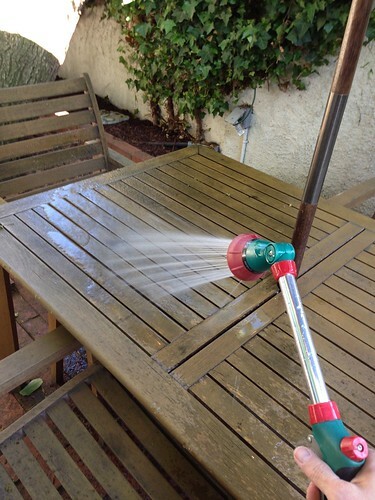 Starting with our gray and cracking table I followed the instructions on the cleaner and soaked the table with the hose sprayer. 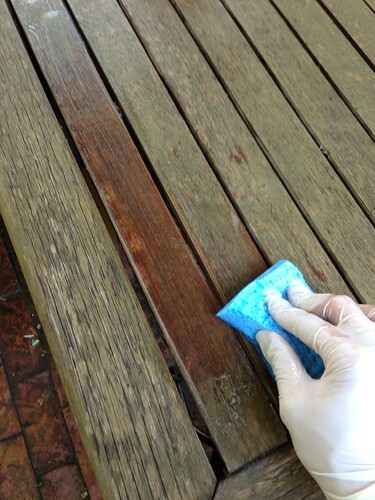 Using a sock as a rag, I began applying the cleaner, which claimed to bring back the original luster of the teak. As you can see, the product sort of sudsed up and created a bit of a lather. The areas that were gray immediately turned the more typical rich teak color, while the areas that still had a layer of the substance we used got sort of orange and splotchy. I can't say for certain how well the cleaner actually worked versus not using anything other than a lot of scrubbing. Ultimately I didn't try an area without the cleaner as a control, but it did seem to loosen up the flaking table top. At first it didn't seem to be doing anything, but one of the directions instructed me to use the included scrubbing pad (which I'm pretty sure I threw away years ago). I could see bits of the old wood beginning to peak through, so I grabbed a dish sponge with abrasive pad and gave that a shot. Though it worked a little bit, I knew I'd need something with a bit more bite to it. I ventured back into the basement and grabbed a few paint scrapers and a pack of #3 steel wool pads. The scraper worked really well, but I had to be extremely careful that I wasn't tearing up the surface of the wood. As you can see, when I started dragging the scraper and really scrubbing with the steel wool, especially after soaking the table a bit more, all of the previous goo started pulling free. 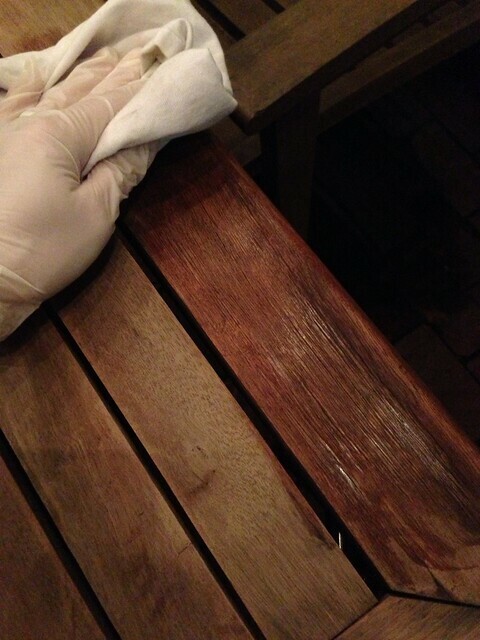 I could see the original gray wood made beautiful once again by the water that had been sprayed on the table. 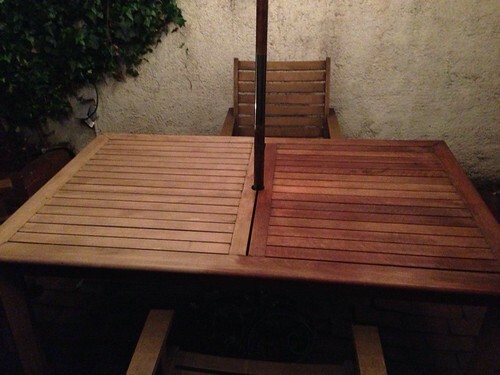 I kept working my way around the table until I was able to take a half and half look at a before and after. I hadn't even applied oil at this point, and this look was spectacular when it was simply wet. I kept working until I had removed all of the buildup from the top of the table. Once it was all removed, I had a difficult endeavor in patience while waiting for the water to dry. 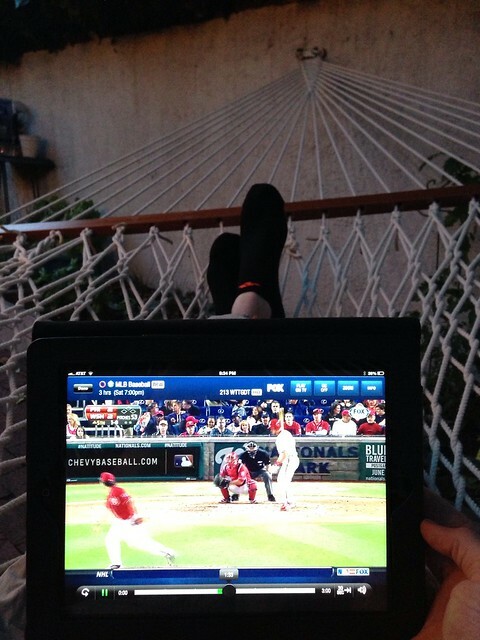 I ended up turning to the hammock while watching the Nationals play on the IPad. Rough wait, I tell ya! It was a cool day, and as the sun set and it turned to night, I continued my efforts. Finally the table was just about dry so I could proceed. 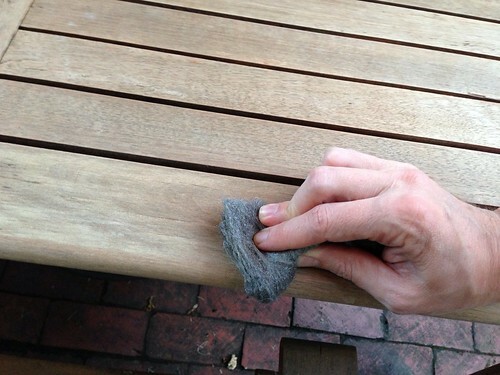 Using some 220 grit sandpaper and "00" steel wool, I sanded the entire tabletop until it was smooth. This removed any of the fuzz or grain that had been left by the standing water, and it evened out any of the stains or areas that needed some extra attention. 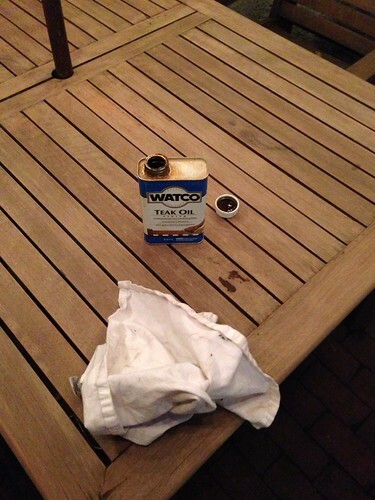 Once fully sanded, I broke open the teak oil and grabbed *the napkin*. I'm talking about the good linen napkin of ours I had used as a paint rag some time ago. Wendy has never let me forget this action of mine, so I make a point to get quite a bit of good use out of my terrible mistake. I hadn't opened the teak oil in so long that I ultimately had to use a vise grip plier to convince the lid open. But as soon as I applied that first bit of oil to the gray and dry table, it drank it right up! After half of the first coat had been applied, the table once again started to show the previous luster we loved so much. It was deep and rich. The project had stretched well into the night, but I finally finished up the first coat of oil. However, it wasn't until the next morning (and day of the baby shower) that I had a chance to really look at how great the newly spruced up table looked. To say I was pleased is an understatement. We noticed the next day after the shower that the table had essentially absorbed the entire oil application, so I went ahead and quenched the wood with a second coat. It turned out looking really great, and we even used the table for a dinner party seafood event with friends on Memorial Day. At this point we've only done the tabletop, but I'm sort of itching to do the legs of the table and the chairs as well. This may allow us to continue using the set for at least a few more seasons. We shall see on that one. 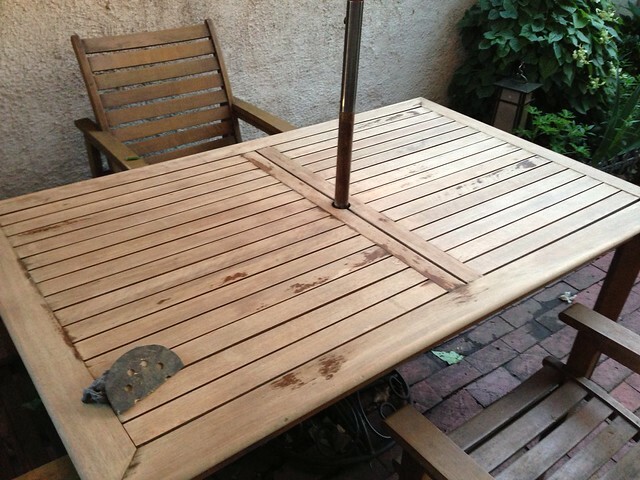 At the very least, we've got ourselves a great looking teak tabletop for this season, and if we do get a new set, I may end up using this teak as salvaged wood to build other outdoor odds and ends. Do you have any experience with teak? 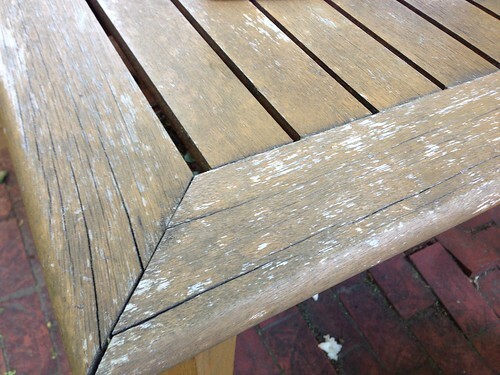 Maybe an outdoor furniture set that needs a little TLC to bring back some of it's former glory? I hope my experience will prove to be useful in helping you breathe life back into your furniture. My father inlaw has the same patio set and his has taken quite the beating over the years as well. I'll be sure to forward this post to him so maybe we can give his patio furniture some much needed love. The results are stunning. Looks brand new! Thanks, Martina! Like I said, the results are so good I'm itching to do the rest. It's such a good looking set that it'd be a shame to let it rot away. Good to know. Keeping this post in mind when I own teak furniture one day.. and I WILL own teak furniture one day. First I'll need a deck and a patio, but you know. It will happen. If I had a dollar for all of the stuff I'll one day own I'd probably have enough money to actually buy some of it! I don't know if we'll buy teak for our next set, but I know we'll definitely own more at some point in our home owning lives. It's good stuff! That's an impressive clean up! 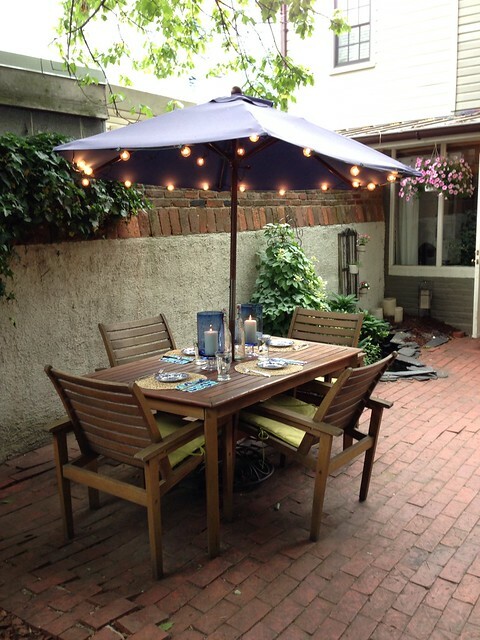 Love your patio space! Thanks, we love the space too. Still quite urban, but very secluded and tranquil. It feels a little like a secret garden. My grandfather sailed and he always had folding teak armchairs on his boats. He gave me 2 chairs (that are now 30+ years old) with instructions never to seal or oil the chairs. 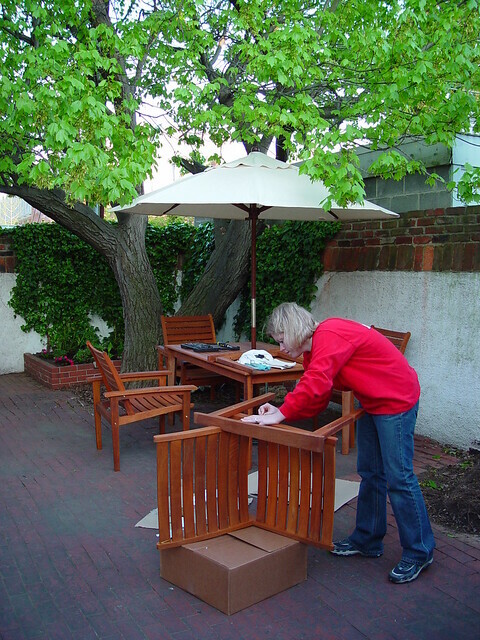 Teak furniture doesn't require any treatment and if left bare it will gray completely. I notice the before is hardly gray - that is likely from the treatments used before which cause uneven weathering. I know the gray patina isn't everyone's taste, but if you don't oil teak it should last a lifetime and be maitenance free. 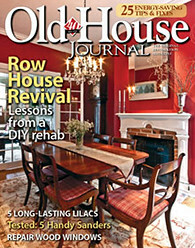 Oiling it will not extend the life of the furniture, but it does set you up for more maitenance down the road. Also, oiling or sealing it actually makes it more likely to mold or mildew - I'm not sure if that is as big of a concern for a backyard as it is for a boat or an oceanside home, but that was part of the warning my grampa gave me. I mean no disrespect, and I think the set looks great and brand new again. I'm just throwing this out there for anyone who would like the no-maitenance approach. Also, one more piece of unsolicited advice - steel wool can actually cause rust spots! Lindsey, thanks for the info on the no-seal approach. I know teak does weather and gray quite a bit, but I didn't realize it was good for the live of the wood. The biggest issue we're seeing now is the failure of the various glue joints. While the wood is still solid and good, the joints are failing, and the chairs are getting extremely wobbly. Might be time to take some of them apart and glue them up again to help them last. Check into using Kreg pocket holes screws. Yes, you will have to buy the jig (if you dont own) but they work really well. After you use for the furniture, you will find many, many places around the home that can use some pocket hole screws. thanks for the post! I bought a used teak patio set (table with 2 leafs max: 43"x96" and 6 folding chairs) the woman had did a little restoration to reinforce the legs but not used it, (she flips furniture) as she bought it used, and she said, the previous owner told her they painted it with patio paint to help it last. It's a reddish brown paint, even and well covered. This makes me sad as I prefer the natural look like you advise, per Grandpa. There are some cracking on the word and the seller said "the wood is trying to breathe" but all in all, it's lovely and in pretty good shape, especially the chairs. I cash see the natural wood in the underside didn't silver much so the painted early but I want to strip it to natural beauty. Can you give me tips please? There are a lot of people who leave their wooden furniture to gray- I did that for a while too- then I sat on it wearing white! Learned my lesson! Gray streaks all over my white jeans! Don't forget about the Sikkens Marine finish, it will last years! And if the furniture gets too out of hand- always looks good painted! 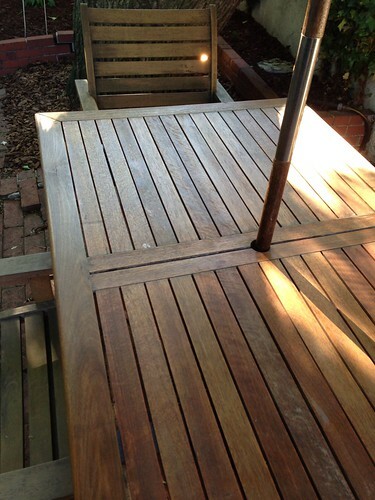 We have just been given a used teak outdoor dining set which, while very nice quality, has had a rough life. The previous owners spray painted the set brown and then left it uncovered on a deck for about 10 years. The brown paint has mostly peeled off, but there is still paint nonetheless. Do you think it would harm the wood if I were to use a paint stripper to remove it? Do you think it's necessary to use a teak cleaner as you did before going to the sanding stage, or can that step be skipped? It's difficult to say exactly what will and won't work without seeing it and without experimenting, but you likely have several different options. I would start with a natural or eco friendly paint stripping product, perhaps a citrus based stripper or other eco friendly approach. Since it's not a lot of paint, and it's already started to come up, this might do the trick. Also, power washing might remove quite a bit as well. Just remember, stripping and washing dries the wood, so you'll want to apply something after to quench the wood again. Perhaps the teak oil I mentioned above. The cleaner is more to restore some of the original color, but it isn't 100% necessary by any means. Remember, it may take a lot of effort and elbow grease, but you'll probably have a pretty great looking furniture set once all is said and done. Just start with one chair and figure out what works for you and then repeat the process. Wow! I think all your hard work paid in the end. Your post is so engaging that I had to read it till the end! While I am little late in commenting, but I guess I couldn't help myself. Did you try to restore the legs of table and chair? Do give us an update on that. I have some teak furniture in my verandah and it is almost 16 years old. I have got it repainted and refinished about 5-6 times in these years and every time I do so, I love its look. Two years back I got the furniture color changed, but I am thinking of getting it back to the original color. Nice job. I also have a Smith and Hawkins patio set consisting of a table and four chairs. It really is weathered grey, but tight. We are down sizing and my daughter just moved into her first home so what better gift than a teak patio set. I pressure washed the furniture with a rotating head resulting in an outstanding outcome. If you use this method start with the underside of a chair to test the process. Using the wrong head will etch the wood. Sanding is still necessary. The chairs take about a half hour each and the table about two hours. This is without the oil . Looks amazing! I must say, I really can't wait for better weather over in the UK so I can get out in the garden and start working on my shed, garden table and the fances. I have had my patio replaced with resin so all that need it s quick jetwash, but the wood has been effected with the bad weather over the winter so that needs some serious TLC. I have a pair of teak adirondack chairs with footrests, about 8 yrs old. Imhad red that since they were outside year round they should be oiled with teak oil. 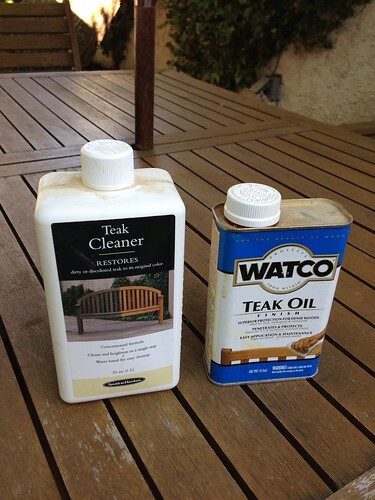 I have applied Watco Teak oil several times over the 8 yrs. The chairs sit on a porch open to weather on 2 sides. Needless to say, they now look horrible and no one will sit on them! 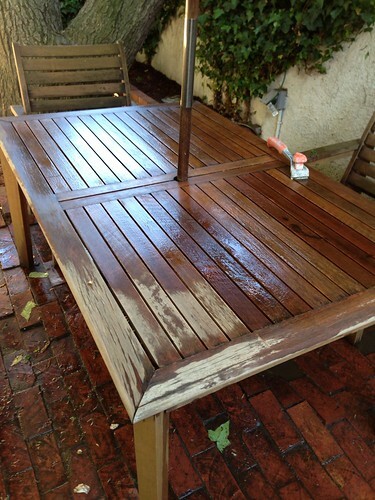 My latest internet search revealed that teak wood should never be oiled because it allows mold & mildew to grow. This is exactly what has happened to my chairs .... turning dark with blackened areas. They look filthy even after cleaning off. 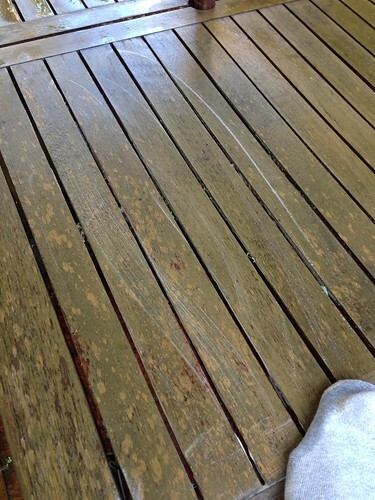 I also discovered that oxygen bleach and a scrub brush can be used to clean the wood ( multiple internet sources). 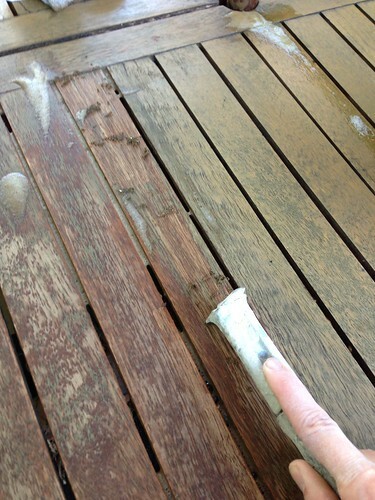 Although Oxi-Clean says on label not to use on teak, that is what I have done. The nasty blackish-green gunk coming off the wood is amazing. ( a combination of oil and mildew and dirt?) The wood looks great when rinsed and still wet, but dries to a quite pale honey color. 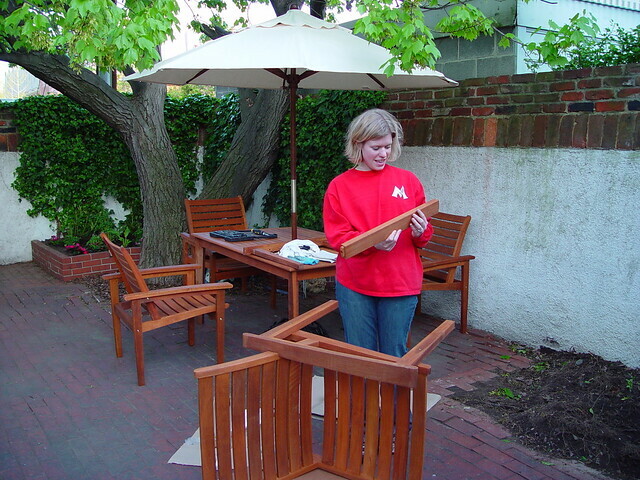 All I would like is to see that beautiful teak color back - maybe they were not teak to begin with? I am itching to oil again, except that the scrubbing has been strenuous and time consuming. Any experience with a teak stain? I have had considerable experience with maintaining outside teak furniture including poolside chaises which have lots of crevices to clean and benches and tables for our patio. I tried the teak cleaners, used Smith and Hawken all with good results but often had to purchase quite a lot of it to get the job done. I never refinished or oiled the teak afraid to create a cycle of future maintenance on what's supposed to be a long term easy care item. 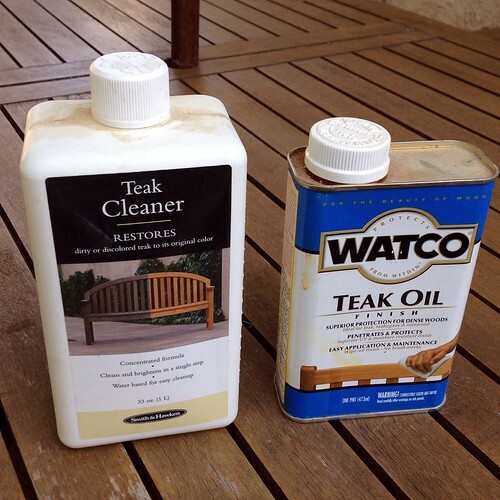 Lately, I discovered the wonder of Oxyclean and this stuff works as well or better than the commercial teak cleaners in my opinion and it's inexpensive ( 1/2 to 1 cup of powder per gallon or two of warm water...apply to wetted teak and let it sit a few minutes and sponge and/or brush the teak clean) also...liquid clothes detergent and warm water works well, but Oxyclean is better because it gets rid of the mold...I do the underside first? I have been using WetandForget on our cedar siding and slate walkways etc and this product is a godsend for keeping mold at bay on just about everything! I am going to spray all our teak with it to stop the growth of mold as I think this is what causes the teak to become dingy looking...we'll see. Thanks, Mark... that was very good! Wish I had seen it before I cleaned my chair set... next time. Are you sure your table really is teak ? I enjoyed reading your posts but thought I'd share that a friend told me to save the work and just apply outdoor bleach to the weathered wood. My table set looked just like your before picture. 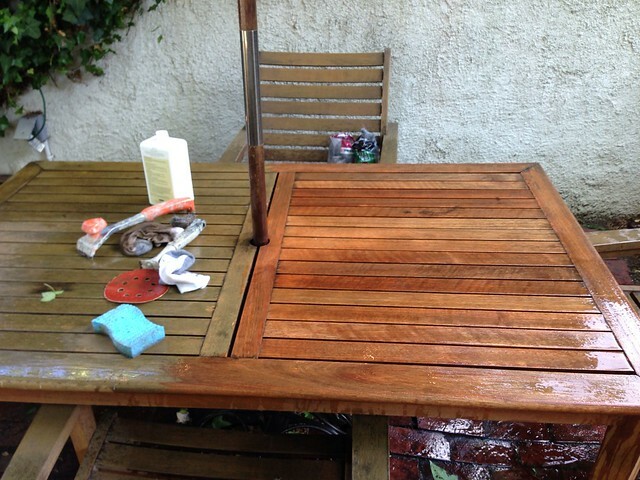 After soaking the wood with the bleach and allowing it to try in the hot sun, it was ready for the teak oil. Looks brand new and new hard labor or scraping was required. 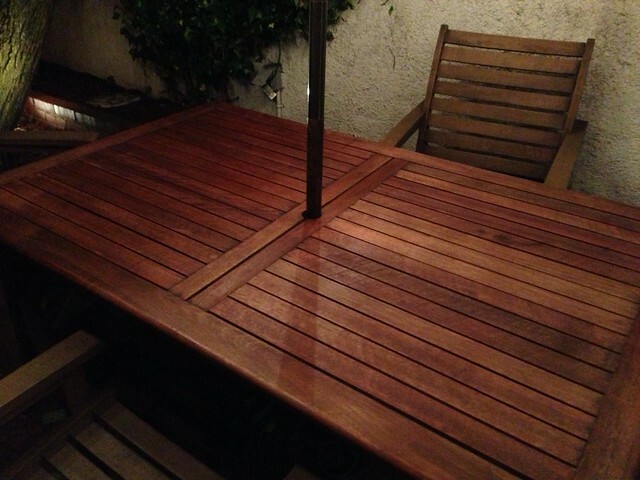 After all that work, it was so sad to see teak oil applied to the fresh wood. A good quality teak protector would have been a much better choice.